Vibrant perspectives on everyday life and leftovers. I recently shared about our jam-packed eight-hour day of freezer meal prepping. My mom and I made all sorts of things like lasagna for no-fuss weeknight dinners, ready-to-bake cookie dough for sweet treats and Easy Freezer Breakfast Sandwiches for hassle-free weekday mornings. 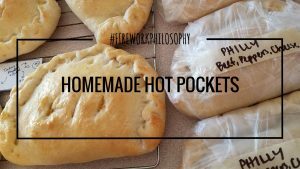 We also made these grab-and-go Homemade Hot Pockets that will be perfect to pack in my weekday lunches. I prefer to take my lunch to work as often as I can. For many reasons. First of all, it saves money. Taking my lunch from home means I don’t spend $5-10 on one meal every single day of the week. Don’t get me wrong, I enjoy going to restaurants. Having someone else prepare and serve our food gives this mama a much-needed break from acting as the meal planner, chef and server but I like to save our dining out budget for weekends with family rather than bailing myself out for lunch each day because I failed to plan ahead. Taking my lunch to work also cuts down on wasted food. When I’m cleaning up after dinner, leftovers are immediately packed into lunch containers so they’re ready to grab in the mornings. Sometimes our leftovers make for a cohesive lunch the next day but you ought to see some of the random leftover combinations that occasionally make up my lunches. But the randomness is okay with me. I like variety. And I hate wasting food. If you follow me on Instagram, you’ll see some of my #leftoversforlunch. But sometimes there aren’t any leftovers. Or the amount of leftovers wouldn’t constitute a decent lunch for the next day. Or you just don’t fee like eating leftover bbq pork for the third day in a row. 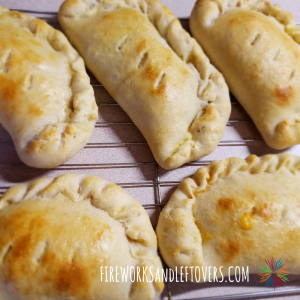 Recipe bonus points – you can customize these Homemade Hot Pockets with fillings to accommodate all of the taste buds in your family. Plus, it’s so much fun to stuff the tasty fillings into a disc of homemade dough, pinch the edges to tuck it all in and paint the tops with egg wash to give them their perfect golden color. If I haven’t convinced you already that you need to make a batch of these to add to your freezer, the fact that they’re super easy may be the smoking gun. Even with a homemade crust, they’re a cinch to made. I tend to run the other way from any recipe involving yeast but this is seriously the easiest dough recipe ever. 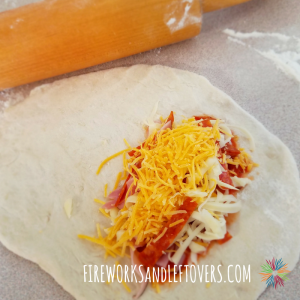 It just takes a little patience while the dough rises and if you’re like me and need more practice with patience, this recipe is just what you need. We made four different versions of hot pockets during our full day of freezer meal cooking: Philly (stuffed with deli peppered roast beef, mozzarella cheese and sauteed peppers and onions), Ham & Cheese (stuffed with, well, ham and cheese), Pizza (filled with pizza sauce, sliced pepperoni, sliced deli ham and mozzarella) and finally, Turkey & Peppers (filled with sliced deli turkey with sauteed peppers and onions). The Turkey & Peppers and Philly will be my go-tos for lunch. The Farmer will of course go after the Pizza and Ham & Cheese because, you know, no veggies. So here it is, without further ado, a solution you’ve been looking for when it comes to easy, grab-and-go, tasty homemade lunches. 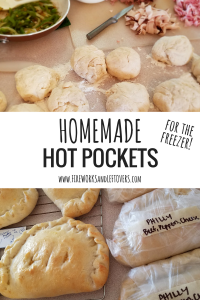 What Homemade Hot Pocket fillings would your family love? Tasty, grab-and-go Homemade Hot Pockets are the perfect, customizable option for weekday lunches. Add 4 cups flour, 1 1/2 T. yeast and 1 1/2 t. salt to a food processor and pulse to combine. Drizzle in 3 T Simply Sunflower Oil or olive oil while pulsing. With the food processor running, drizzle in 1 1/2 cups warm water until the dough forms a ball in the processor. Do not over mix or the dough could get tough. Repeat that process with the other half of the dough ingredients and add both batches to a large glass bowl and cover with plastic wrap. Allow the dough to rise in a warm place until it doubles in size. Prepare your deli meats, shredded cheese, shredded meats and/or sauted or steamed vegetables. Allow warm meats and veggies to cool before assembling the Hot Pockets. Once the dough has doubled in size, place it on a floured working surface and divide into 16 equal dough balls. Flouring the surface as needed, roll out each ball of dough. Add about 1/2 - 3/4 cup of fillings to half of the rolled out dough. Fold the other half over the filling. If there's plenty of room for more filling, add a little extra. Fold and pinch the edges to seal. Place each Hot Pocket on an ungreased baking sheet and brush with the egg wash (one egg wisked with 2 T water). Cut three slits in the top of each Hot Pocket to allow steam to escape while baking. Bake in a preheated 450°F oven for 12-14 minutes or until the crust is golden brown. Transfer to cooling racks. Once they are cool, wrap each hot pocket tightly in plastic wrap, add a label (masking tape works great) to identify the filling and store in a freezer bag labeled with the reheating instructions. REHEATING INSTRUCTIONS: Remove plastic wrap. Wrap in paper towel. Microwave frozen hot pocket for 1 1/2 minutes and let sit in the microwave for 1 minute. Microwave thawed hot pocket for 30-60 seconds or until warmed through. PHILLY: Sliced deli roast beef, shredded pepper jack cheese and sauteed peppers and onions. HAM & CHEESE: Sliced deli ham and shredded cheddar cheese. TACO: Cooled taco meat, cheddar cheese, sauteed peppers and onions. TURKEY & BROCCOLI: Sliced deli turkey, cheddar cheese and cooled steamed broccoli. TURKEY & PEPPERS: Sliced deli turkey, cheddar cheese and sauteed peppers and onions. CHICKEN CORDON BLEU: Shredded chicken, sliced deli ham and shredded swiss cheese. PIZZA: One teaspoon pizza sauce spread across half of the dough, sliced deli ham, sliced pepperoni, shredded mozzarella cheese and sauteed peppers and onions. TIP: Run your clothes dryer for a few minutes then place the bowl of dough in the warm dryer to help it rise. TIP: If you're making more than one filling option, be sure to add the Hot Pockets with the same filling to the same baking sheet or make a note of the position of each filling when they're placed on the baking sheet. Keep the same placement when they're transferred to a cooling rack. This will help you know how to label them before placing them in the freezer. Thanks for stopping by! 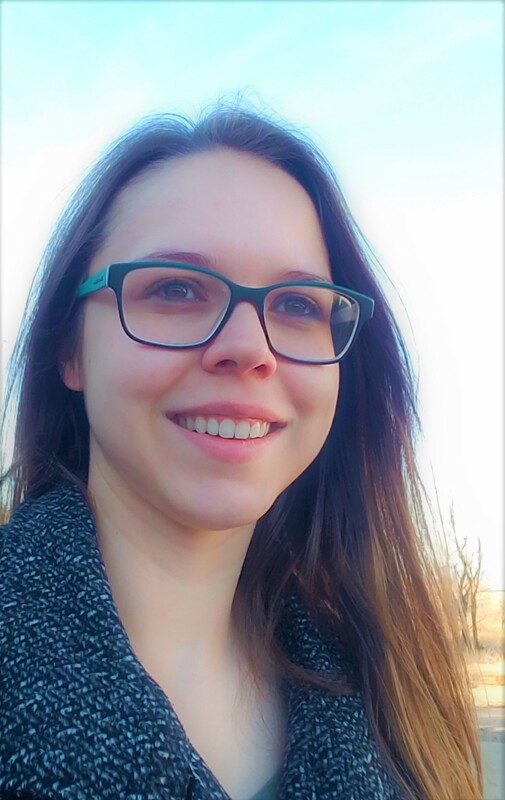 I’m a full time working mama living the good life in Central Nebraska. I can’t wait to share easy (yet tasty) recipes and positive perspectives on everything I’m learning in life.